In England and Northern Ireland there are still no policies in place. 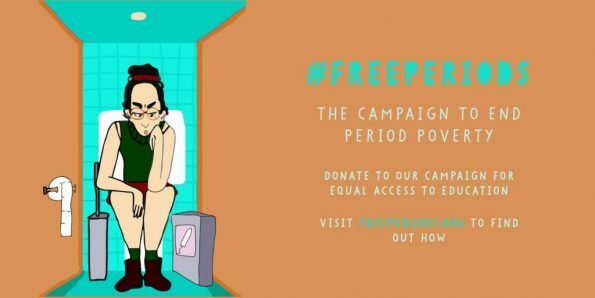 Amika George, founder of Free Periods and ‘period poverty’ activist, has announced a new legal campaign to provide free menstrual products to all schoolchildren. The Free Periods campaign, in partnership with the Red Box Project and supported by The Pink Protest, seeks to ensure that menstrual products should be freely available in schools to all children who need them. Access to education is a fundamental human right, and clearly no child should be forced to miss school as a result of not being able to afford pads or tampons. In the UK, 1 in 10 young women aged 14-21 have been unable to afford period products. In London alone, 80,000 young women and girls are affected by period poverty. And 49 per cent of girls have missed an entire day of school because of their period. 2018 saw significant progress for the cause in Britain, with the Scottish government becoming the first national government ever to provide free access to menstrual products in all schools, colleges and universities, and in Wales, the government pledged £1m to address period poverty. The campaign was launched with a crowdfunding drive to raise funds for exploratory legal work and in support of the broader legal campaign, with the requirement that £10,000 had to be raised in 30 days for any of the pledges to be collected. This target was reached in under one week from pledges made ‘by 399 AMAZING people’, allowing Free Periods to take the next step forwards in the legal campaign. This new legal campaign follows the one-year anniversary of the Free Periods protest to end period poverty, where over 2,000 people gathered outside Downing Street to call out the UK government’s failure to take action against period poverty. The campaign launch also featured a film made by Emmy-award winning filmmaker, Lina Plioplyte, featuring Amika George and ten schoolgirls from London. Amika George said: “I am tired of the government’s inaction and so, just over one year on from our Free Periods protest to Parliament, I am proud to launch a legal campaign, calling on the UK government to provide free, universally accessible menstrual products in schools and colleges. And Anna Miles, co-founder of the Red Box Project and director of Free Periods, added: “We are proud to provide thousands of schools with red boxes of free period products. “This is made possible by the kindness and generosity bestowed upon us by local communities across the UK and the hard work of our over 200 volunteer coordinators. “But access to education should not rely on the kindness of others. To visit the Free Periods crowdfunding page click here. For more information about the campaign click here.